My answer begins with forage digestibility, or to be more specific, fiber digestibility. I then get a facial expression similar to what I might receive if I had told them the automobile is revolutionizing human transportation. Perhaps it’s not so much that fiber digestibility is a new concept, but how we are valuing and measuring it certainly is. Further, we haven’t reached the last mile marker. As analyses go, the total fiber content, as measured by neutral detergent fiber or NDF, is perhaps the first and most important metric to know, but following closely behind is the digestibility of that fiber. 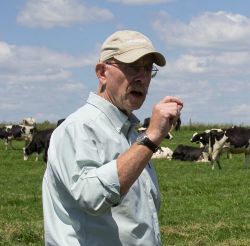 Livestock producers, nutritionists, agronomists, and researchers are currently exploiting forage and fiber quality concepts in a variety of new ways. It’s because highly digestible forages can boost dry matter intake and cut feed costs. It also doesn’t cost any more to harvest highly digestible forage compared to a similar forage with low digestibility. A lack of energy in the livestock diet often limits performance, especially for lactating cows or growing animals. In a forage-based diet, high energy often is dictated by fiber digestibility and the rate of digestion. Protein is important, but rarely limits animal performance. The alphabet soup of fiber digestibility metrics is ever growing. You can count among them NDF digestibility (NDFD), undigested NDF (uNDF240), total tract NDF digestibility (TTNDFD), relative forage quality (RFQ), or a summative TDN calculation. These metrics now litter most forage test analysis sheets, often turning your forage testing results page into something that more resembles an ancient Greek scroll. However, if these analyses don’t appear, perhaps it’s time to investigate using a different forage lab. As you assess the fiber digestibility status of last year’s forages, keep in mind that there are three primary factors that will explain the results — good or bad. Growing environment: This is one factor that can’t be controlled and often has a profound negative impact on fiber digestibility in regions plagued by hot weather and drought. Cool temperatures, especially at night, will have a positive impact on fiber digestibility. Time of harvest: Fiber digestibility declines with plant maturity. Hence, the stage of plant development when forage is cut or grazed will in most situations have the largest impact on the harvested fiber digestibility. To capture the “grass advantage,” stands must be cut early before seedheads appear. Genetics: Species and variety selection is another way to improve fiber digestibility. Among grasses, species such as meadow fescue and ryegrass have proven superior to their counterparts. Also, since fiber digestibility has risen in hierarchy, plant breeders have developed alfalfa varieties that are significantly better than previous offerings. It makes little sense to capture yield of additional fiber that isn’t digestible. Though not all livestock classes demand forages with high-fiber digestibility, rare is the year when too much high-quality forage is a problem. Harvesting relatively high fiber digestibility forage is economically beneficial whether you feed it or sell it. As a forage producer, seize that opportunity. This article appeared in the February 2019 issue of Grower on page 4.